Plants annual. 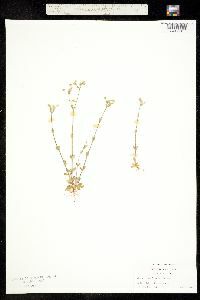 Stems erect, simple or branched at base, 5.5-30 cm, shaggy, hairs silvery, spreading-ascending; small axillary tufts of leaves absent. Leaves not marces-cent; blade 4-15(-20) × 1.5-5(-7) mm, pubescence of long, glandular and/or eglandular hairs; basal ± crowded, blade oblanceolate, spatulate, apex obtuse; cauline sessile, blade lanceolate or elliptic, apex acute. Inflorescences lax, dichasiate, 3-30-flowered cymes; bracts herbaceous, lanceolate, densely pubescent, with long, ascending, glandular or eglandular hairs. Pedicels erect or ascending, bent distally in fruit, 6-15 mm, longer than capsule, shaggy, glandular or eglandular. Flowers: sepals lanceolate, 4-4.5 mm, foliaceous, with or without narrow margins, densely pubescent, hairs exceeding sepal tips; petals oblanceolate, 2-3 mm, ca. 0.5 times as long as sepals, apex 2-fid, sparsely ciliate proximally; stamens 10, with few long hairs near filament base; styles 5. Capsules cylindric, slightly curved near apex, 5-7 mm, ca. 1.5 times as long as sepals; teeth 10, erect, margins convolute. Seeds pale brown, 0.5 mm diam., acutely tuberculate; testa not inflated. 2n = 72 (Europe), 88, 90. Flowering spring. Dry, sandy places, roadsides, arable land, disturbed, open areas; 0-400 m; introduced; Ala., Ark., Fla., Ga., Idaho, Ill., Ind., Kans., Ky., Miss., Mo., N.Y., N.C., Ohio, Okla., Oreg., Pa., S.C., Tenn., Tex., Va., W.Va.; Eurasia. 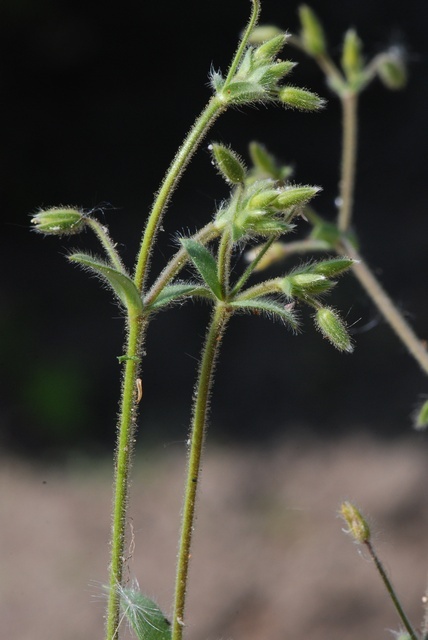 The wholly herbaceous bracts of Cerastium brachypetalum distinguish it from C. fontanum subsp. vulgare, C. semidecandrum, and C. pumilum; the ciliate petal and filament bases distinguish it from C. diffusum and C. glomeratum. Cerastium brachypetalum differs from all those species in the long, silvery hairs that give it a grayish appearance. In Europe C. brachypetalum is more variable and eight subspecies have been recognized, two of which-subsp. brachypetalum and subsp. tauricum-occur in North America. However, they differ only in the absence or presence of glandular hairs, an insufficient distinction for recognition at the subspecific level. Similar to C. viscosum, but with a more open, dichasially branched infl, the pedicels mostly longer than the sep; bracts conspicuously long-hairy, not glandular; pet often shorter than the sep; stamens to 10. Polyploid series probably based on x=9 or 18. Native of Eurasia, now widely but irregularly intr. in our range, especially southward. Apr., May.